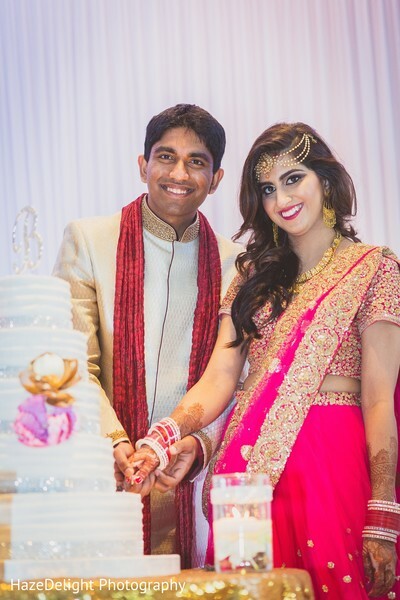 After tying the knot, the newlyweds were ready to celebrate at their Indian wedding reception! First, though, our Indian bride had to change into a fabulous new outfit! 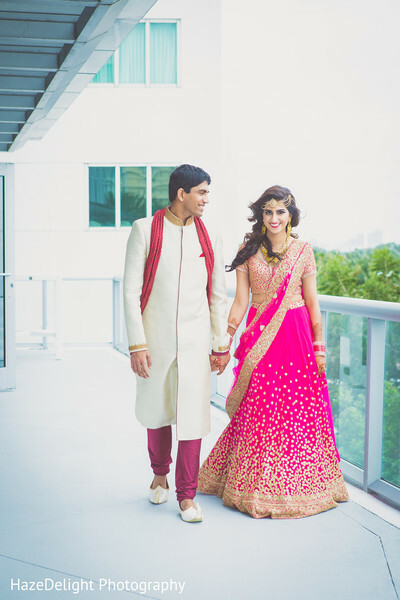 Her reception lengha was hot pink and gold, and we love how the embroidery created a gradient effect! The wonderful Glam By Mevi swapped the Maharani's lipstick color to keep her look perfectly coordinated and dazzling; then, it was time to party! 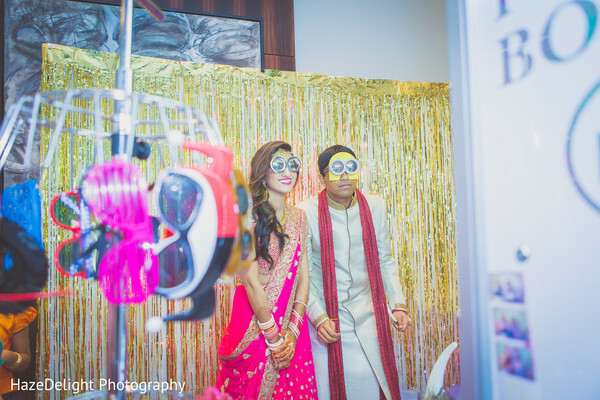 Envi Event Planning designed and planned the stunning reception, which featured marvelous centerpieces by Suhaag Garden and a fun photobooth! 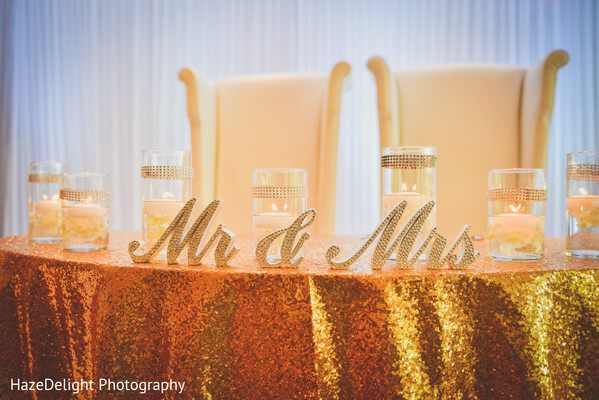 See the rest of the reception moments that HazeDelight Photography captured in the full gallery! 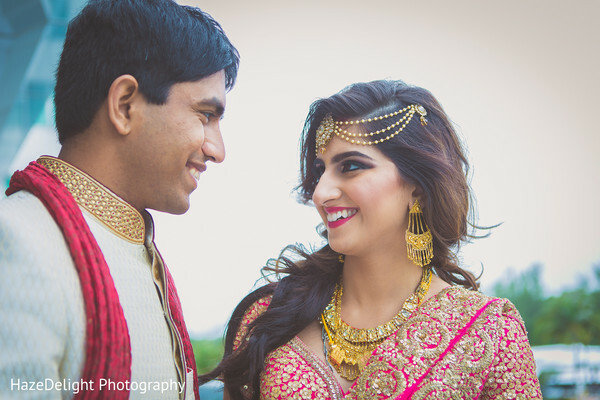 "I spent hours researching certain looks I liked in Indian Bridal. I wanted to go to India so badly to check out all the Indian designers stores in person but due to the time crunch before the wedding and my crazy schedule I couldn't. So instead I had to rely on my mom and aunt when they were in India and the modern technology of Facetime. As I had mentioned earlier, we decided on a beautiful fuschia pink Sabyasachi Bridal lengha for my wedding day, and for my Mehndi/Sangeet we went with a chic blush pink lengha-saree by Pam Mehta. Both of which looked amazing and its all thanks to the help of my mom and aunt!" "Mehwish from Glam By Mevi was phenomenal! I showed her a couple of pictures of makeup styles I liked (ones heavily focused on smokey eyes) and she asked the color of my outfit and created a beautiful makeup look all on her own! My skin looked flawless and my eye makeup was so dramatic and beautiful. I knew instantly when she did my makeup that she was the perfect makeup artist for my dream wedding. For my hair I had found pictures online of two different looks - one straight with a braid on the top front and then the other look was hair parted sideways with long side curls, both of which she recreated to look exactly like the pictures I found online. I couldn't have been happier with the way my hair and makeup turned out and it's all thanks to her!" "I had amazing vendors for my wedding! I highly recommend all of them! Thanks again to all of them for all their hard work and coordination! I was very happy to have picked out all these vendors for my special day!" Enjoy the rest of your day, Maharanis, and we'll be back with another superb shaadi tomorrow! 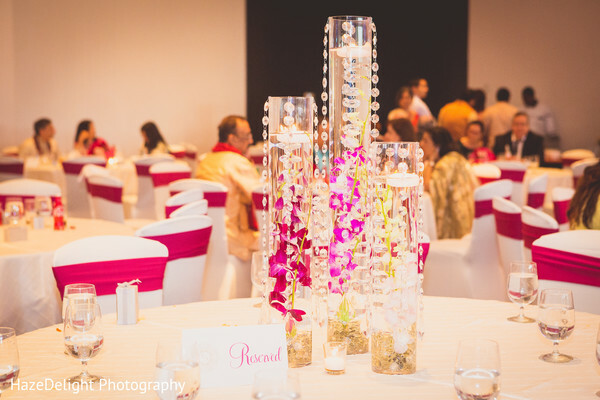 Envi Event Planning, Suhaag Garden and Glam By Mevi are members of the Platinum Guide. Love what you see? Explore their portfolios.